Now that the iPhone 6 and iPhone 6 Plus are officially (depending on luck) available in stores it’s time for stress tests and benchmarks. Raymond Soneira’s Display Technology Shootout is no exception: it measures how Apple’s latest handsets stack up against the competition. Did Apple manage to improve the display? After putting the devices under comprehensive DisplayMate Lab tests, that measured screen reflections, brightness and contrasts, colours and intensities, viewing angles, LCD spectra and display power, this is what Soneira found: the iPhone 6 is the best performing smartphone LCD display DisplayMate has ever tested. Compared to its competition, Soneira says Apple has used the best mobile LCD displays with the iPhone 6 and 6 Plus, though the Samung Galaxy S5 and Note 4 incorporate the best mobile OLED displays. 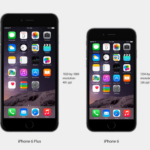 The display on the iPhone 6 has almost identical performance to the iPhone 6 Plus – but it only has a 1.0 Mega Pixel display, significantly lower than the 2.1 to 3.7 Mega Pixels found on all of the other leading Smartphones.